On the second floor of the museum’s addition, cabinet after cabinet displays amazing artifacts. 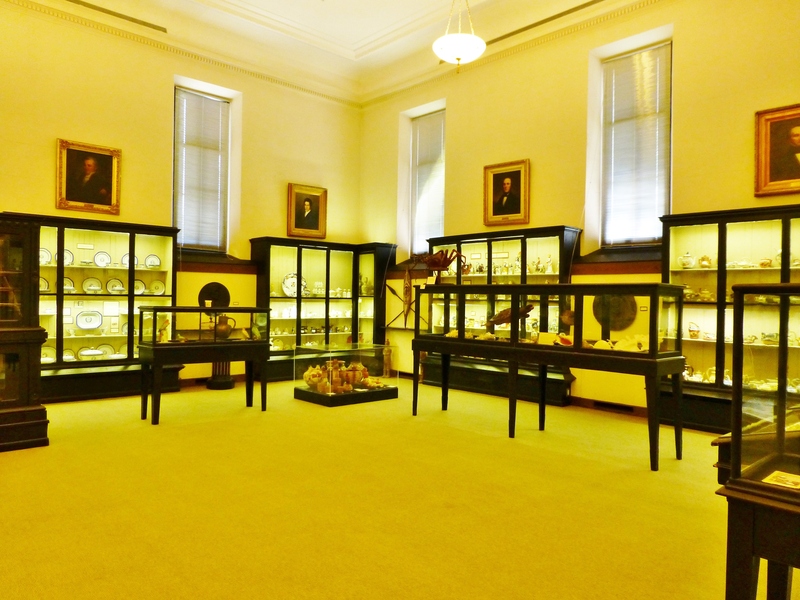 ‘Cabinets of Curiosities’ were also known as ‘wonder rooms’ as far back as the Renaissance. 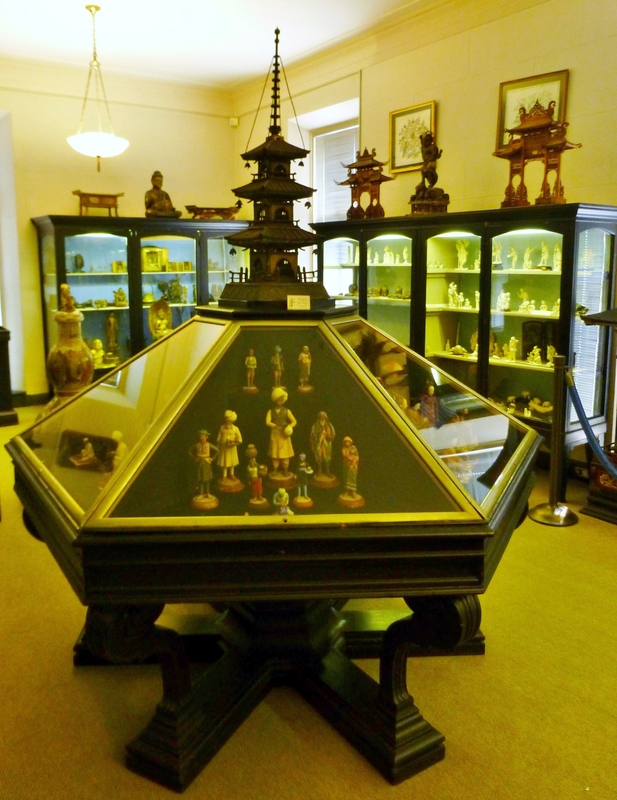 They typically display small collections of extraordinary objects, categorized and displayed for educational purposes. The Ryerss Museum & Library was opened to the public in 1910 under the administration of the Fairmount Park Commission. The front entrance is currently not used by the public and visitors must enter through a side entrance. Before heading back over to the 2014 Hampton Designer Showhouse (I still have several more rooms to share with you in that fabulous designer house, not to mention the phenomenal Mansion in May designer house, which I never finished sharing), I wanted you to see the inside of the wonderful Victorian Ryerss Mansion. The main visitor’s entrance to the museum and public library is from the side of the Ryerss Mansion. 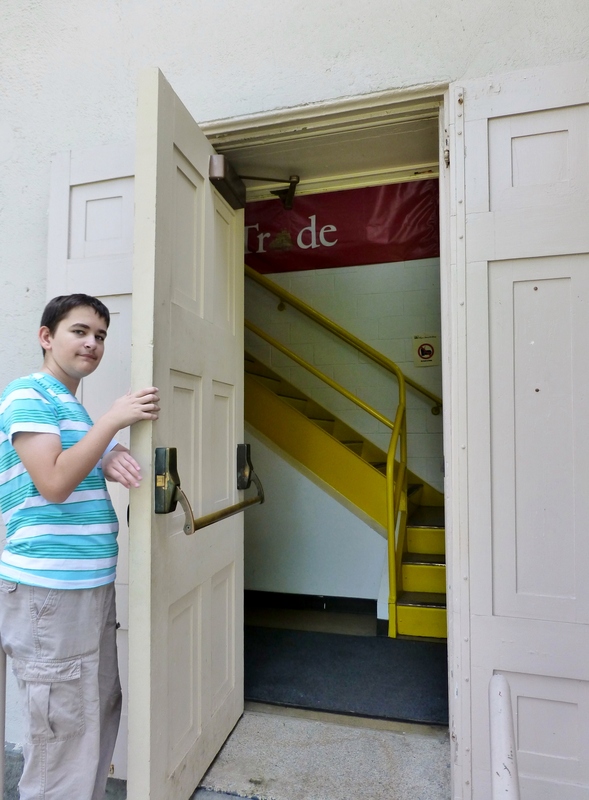 Grady and I were quite surprised at the industrial feel of this modified entrance, but once you make your way up the stairs and into the museum, wonderful things are in store! The main entry brings you up some stairs and into the library which was created in 1910. 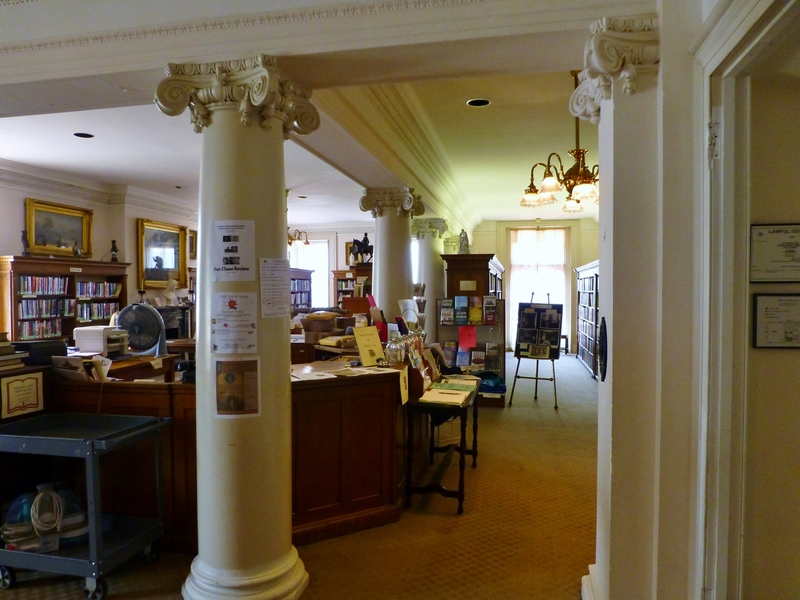 As an independent circulating library, it lends current fiction, popular bestsellers, nonfiction, children’s literature, classic literature and reference materials. 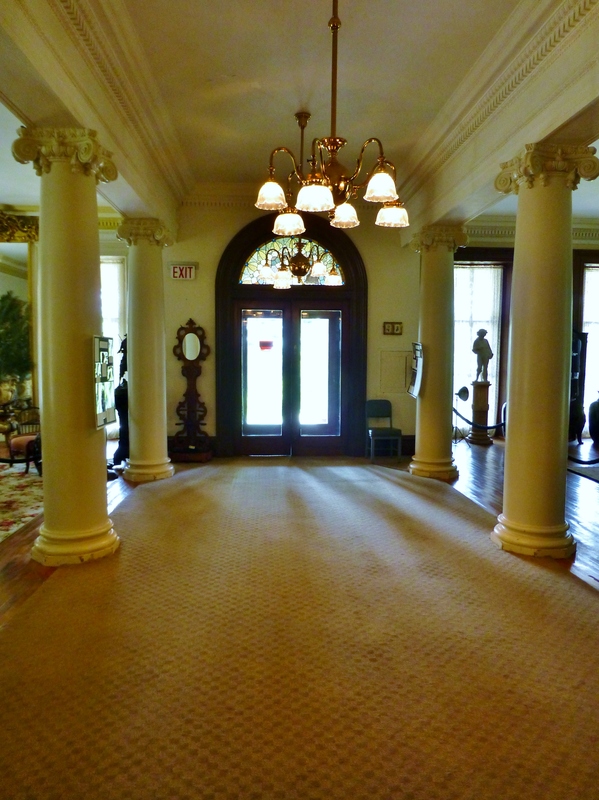 This is the second floor of the original mansion. 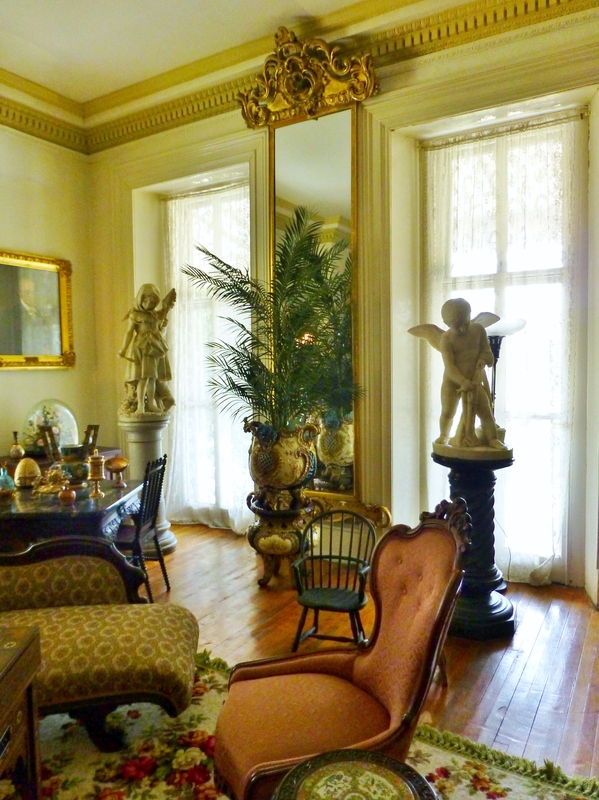 The walls between bedrooms were removed and beautiful Greek columns and support beams embellished with dentil moldings were added to open up the second floor of the mansion. 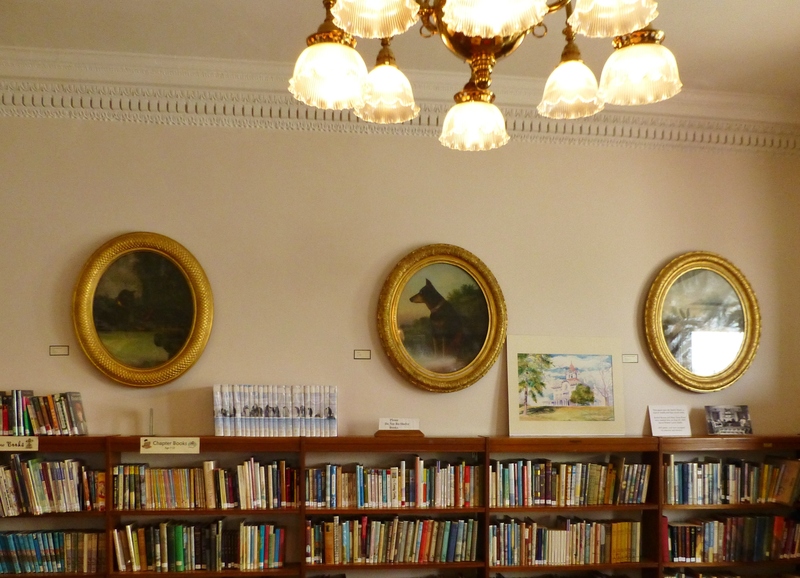 This photo shows the children’s department, with some of the historic pet portraits displayed above the shelves. I shared detailed information about them in my last post. 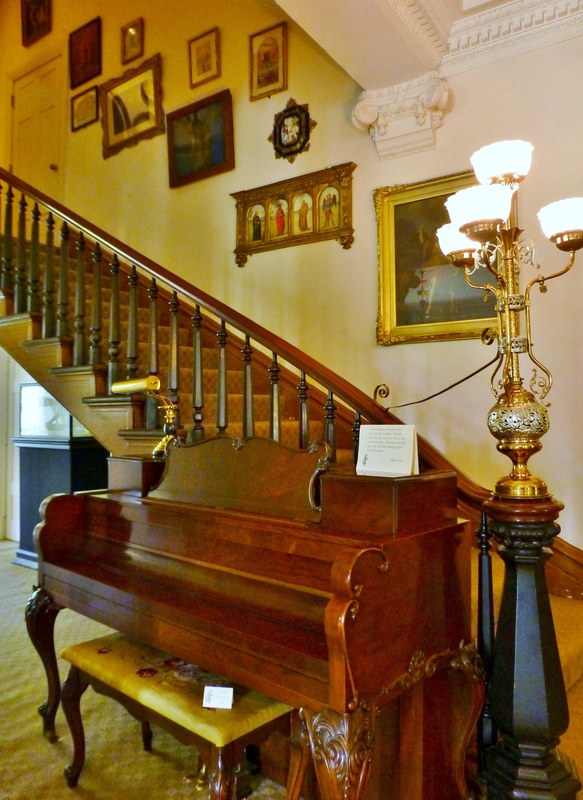 After descending the stairs to the first floor of the original home, you are able to appreciate the real treats of this museum. Check out that amazing newel post light! 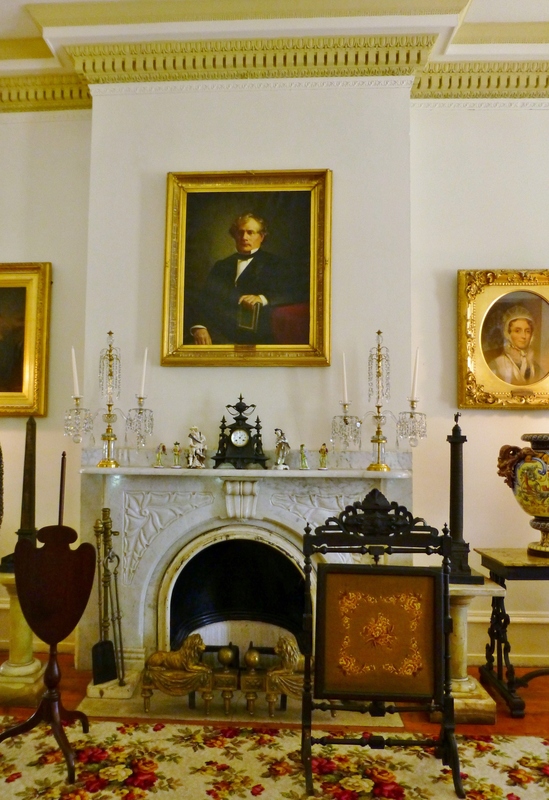 Formerly the main entrance to the home, the front parlor walls have been removed (just like the upstairs library) and the entire first floor has been made into a repository for objects collected by the Ryerss family from around the globe. 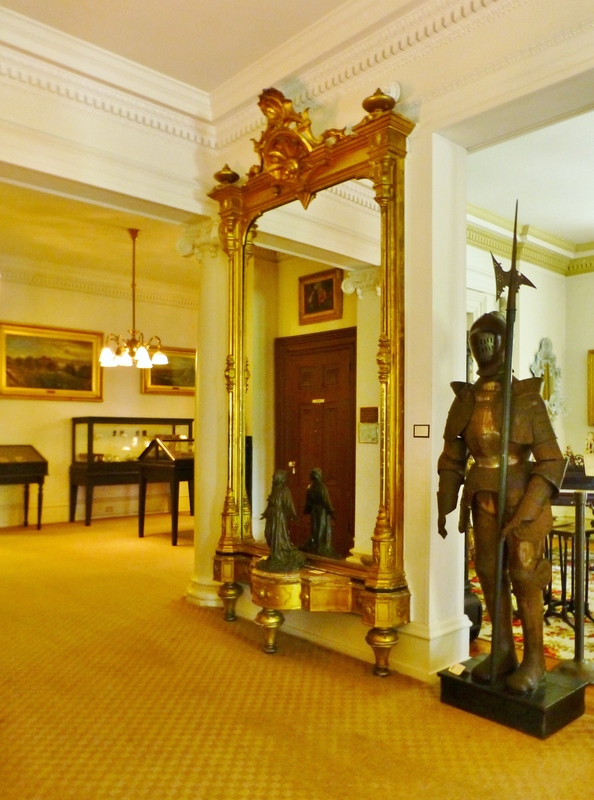 Unlike most house museums, the priceless objects at the Ryerss Mansion are on display in a somewhat random manner. That gold pier mirror is just amazing, isn’t it? And I’m enraptured with how the marble sculptures glow in the sunlight streaming through the floor to ceiling windows. Portraits of Ryerss family members are hung on the walls and various furnishings are scattered about. 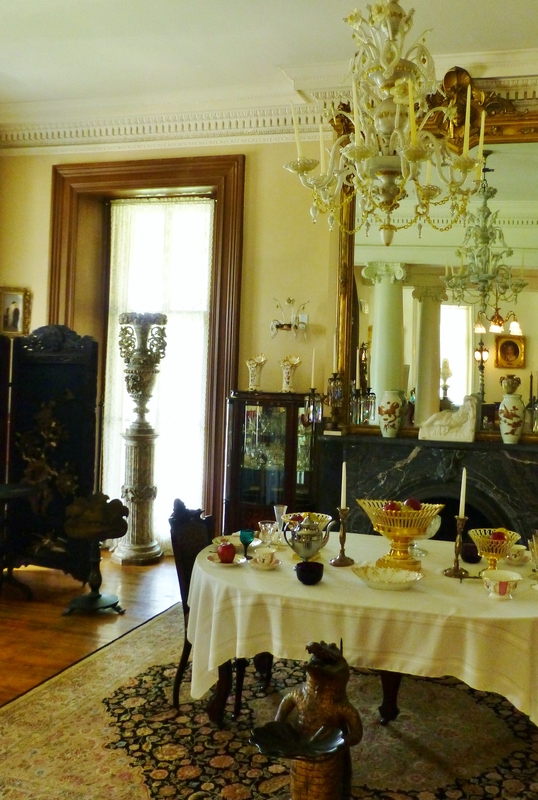 This is the former dining room with it’s oval table and various pieces of tableware. 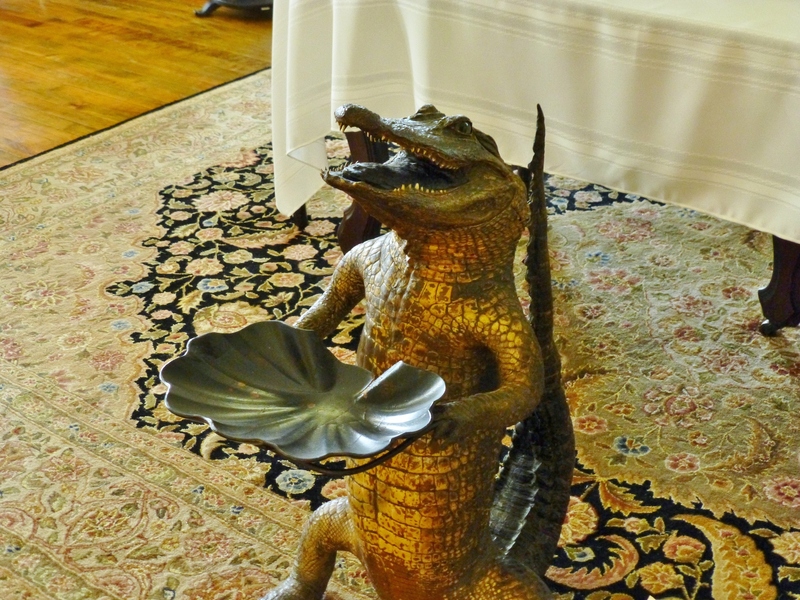 This little fella is a stuffed Alligator calling card holder. He has become somewhat of a mascot at Burholme. Isn’t he amazing?! A large addition was added to the back of the mansion in 1923. These rear galleries were added to display a truly vast number of objects collected by the Ryerss family over many years. This lower level houses numerous Asian objects. Many of the items are displayed in custom cabinets which were fabricated at the turn of the century just for this purpose. I especially admire these octagonal, faceted displays and their Ebonized wood bases. The cases themselves are lovely pieces of furniture! On the second floor of the addition, cabinet after cabinet displays amazing artifacts. Cabinets of curiosities, like these, were also known as ‘wonder rooms’. 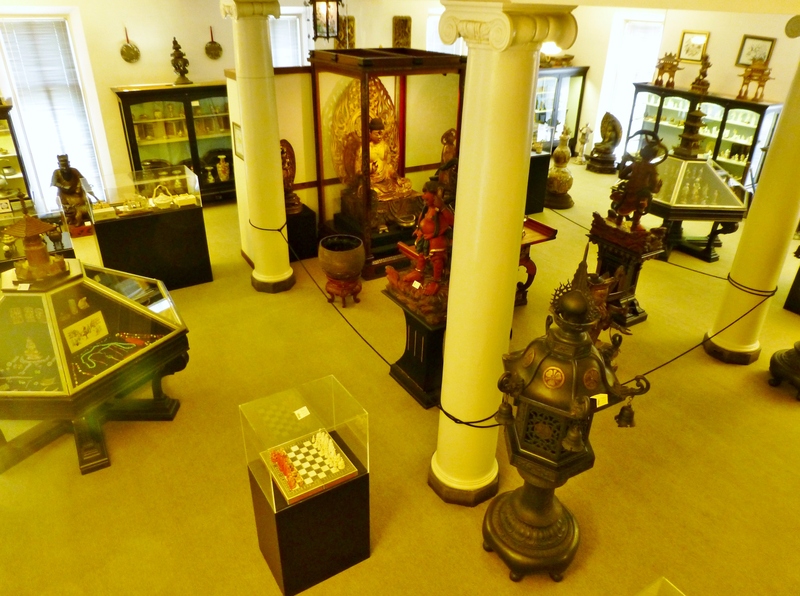 They typically display small collections of extraordinary objects, attempting to categorize and tell stories about the wonders and oddities of the natural world and sometimes other cultures. 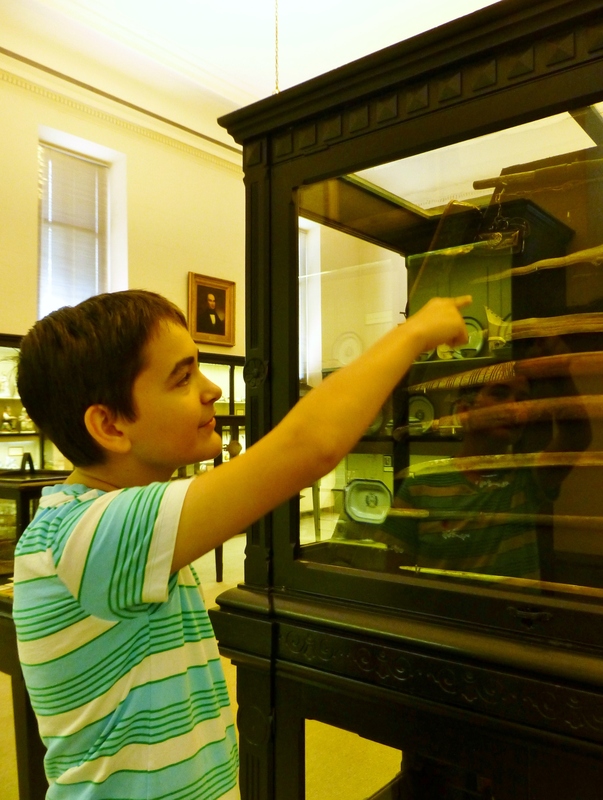 Grady, like most boys, especially enjoyed perusing some of the ancient weaponry on display. You can also appreciate some of the wonderful details of the display case in this photograph. I love the Victorian styling of these custom pieces of furniture! The objects in the cases are widely varied. 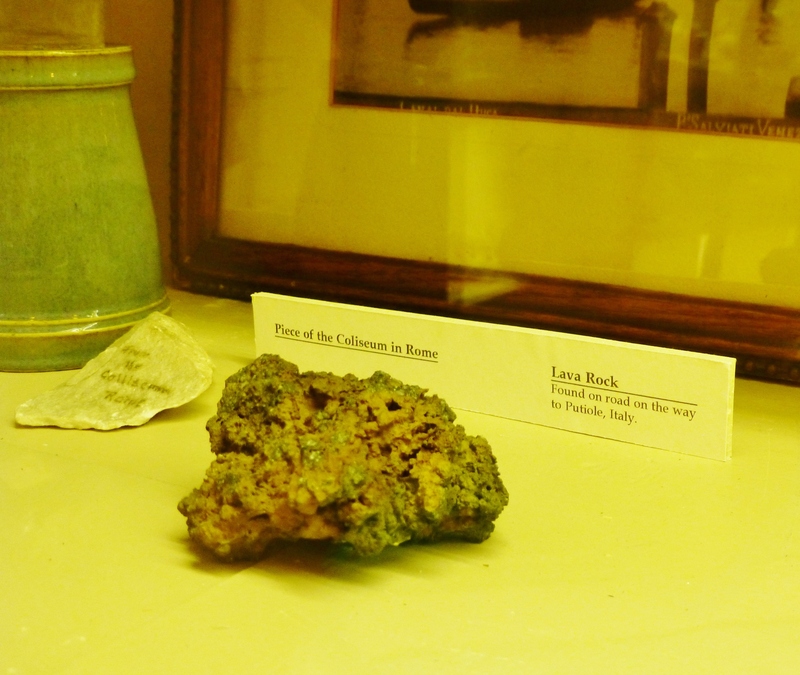 For instance, this image is of an ancient lava rock and a fragment of the Coliseum in Rome. Thousands of items are labeled and on display in a typical Victorian manner. 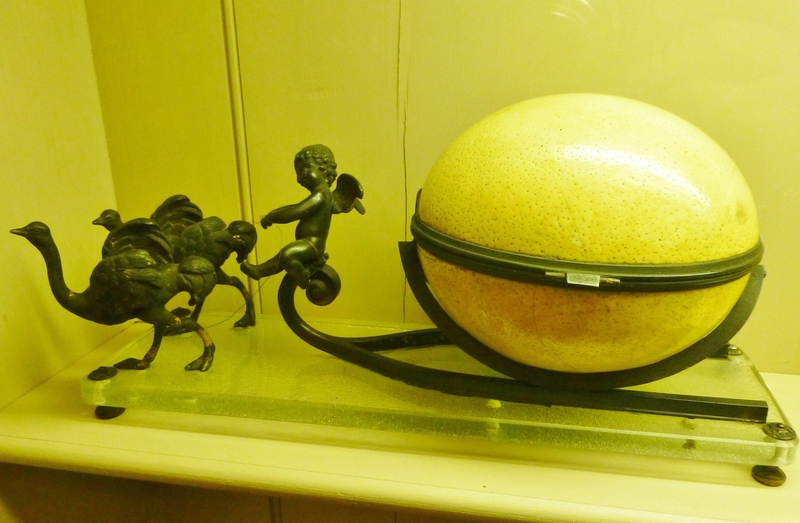 And check out this amazing Ostrich Egg box! 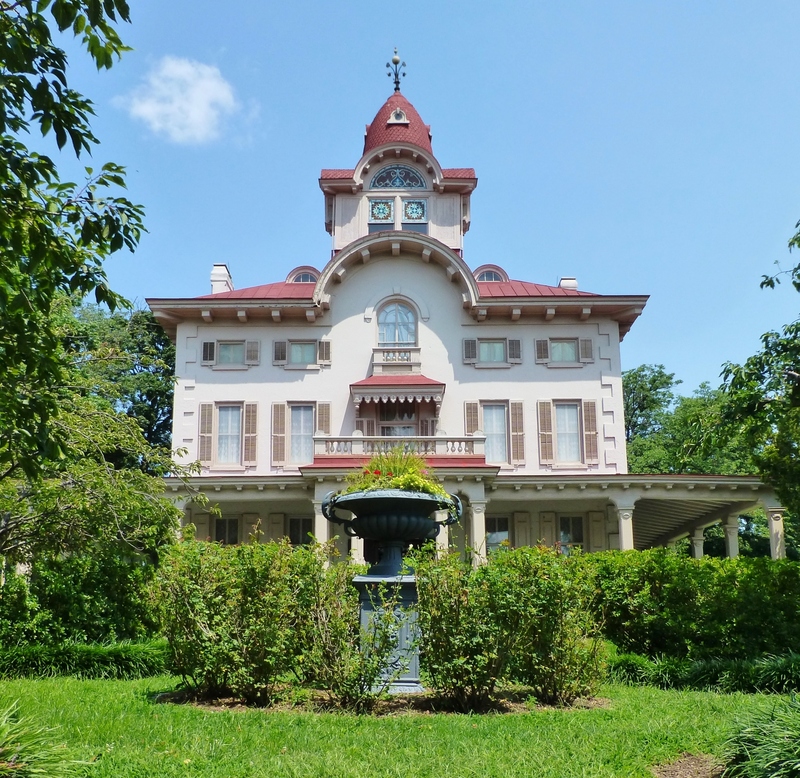 So if you’re ever in the Philadelphia area, planning an itinerary, I would recommend Burholme for a stop on your journey. Amazingly enough, admission is FREE (although donations are always welcome), and the staff is so nice and eager to share their knowledge. The Ryerss family history is super interesting too (there are juicy scandals, like when Robert Ryerss married his housekeeper)! In the meantime, don’t forget to tell everyone you know about Kristine Robinson’s Interiors…I need all the friends I can get! This entry was posted in Antiques, Architecture, Historic Sites, Robinson Interiors, Victorian and tagged Antiques, Artefacts, Asian, Burholme, Cabinet of Curiosities, Furniture, Library, Pet Cemetery, Philadelphia Museum, Pier Mirror, Ryerss. Bookmark the permalink. I’m sure the Ryerss Mansion has many photographs of the mansion from previous years. It is a really special place! You should try to contact them via their Facebook page, or at their website: http://www.ryerssmuseum.org/ Have a great day and thanks for visiting my blog!